The client application receives an HTTP status code of 503 with the message "Service Unavailable" as a response to an API request. 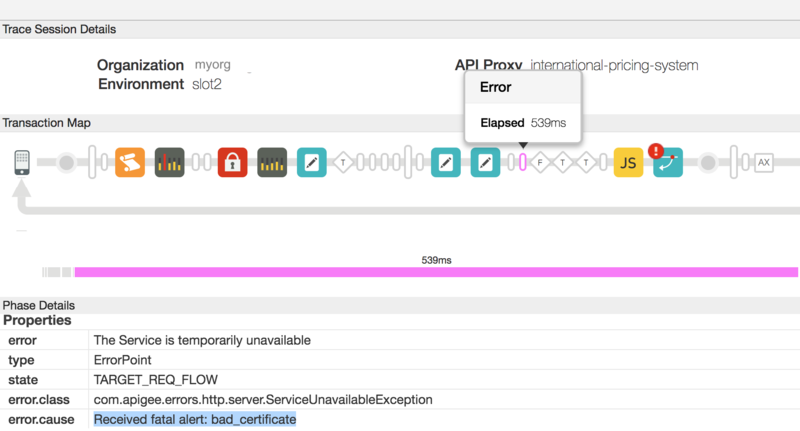 In the UI trace, you will observe that the error.cause is Received fatal alert: bad_certificate in the Target Request Flow for the failing API request. If you have access to Message Processor logs, then you will notice the error message as Received fatal alert: bad_certificate for the failing API request. This error is observed during the SSL handshake process between the Message Processor and the backend server in a 2 way TLS setup. Enable trace in the Edge UI, make the API call, and reproduce the issue. In the UI trace results, navigate through each Phase and determine where the error occurred. The error would've occurred in the Target Request Flow. As you see in the screenshot above, the error.cause is "Received fatal alert: bad_certificate". You can get the message id for the failing API request by determining the value of the Error Header "X-Apigee.Message-ID" in the Phase indicated by AX in the trace. The Message Processor log had a stack trace for the error Received fatal alert: bad_certificate, but does not have any further information that indicates the cause for this issue. To investigate this issue further, you will need to capture TCP/IP packets using tcpdump tool. If you are a Private Cloud user, then you can capture the TCP/IP packets on the backend server or Message Processor. Preferably, capture them on the backend server as the packets are decrypted on the backend server. If you are a Public Cloud user, then capture the TCP/IP packets on the backend server. Once you've decided where you would like to capture TCP/IP packets, use the below tcpdump command to capture TCP/IP packets. Note: If you are taking the TCP/IP packets on the backend server, then use the public IP address of the Message Processor in the tcpdump command. If you are taking the TCP/IP packets on the Message Processor, then use the public IP address of the backend server in the tcpdump command. If there are multiple IP addresses for backend server/Message Processor, then you need to use a different tcpdump command. Refer to tcpdump for more information about this tool and for other variants of this command. Analyze the TCP/IP packets using the Wireshark tool or similar tool with which you are familiar. Message #4 in the tcpdump above shows that the Message Processor (source) sent a "Client Hello" message to the backend server (destination). Message #5 shows that the backend server acknowledges the Client Hello message from the Message Processor. The backend server sends the "Server Hello" message along with its Certificate, and then requests the Client to send its Certificate in Message #7. The Message Processor completes the verification of the Certificate and acknowledges the backend server's ServerHello message in Message #8. The Message Processor sends its Certificate to the backend server in Message #9. The backend server acknowledges the receipt of the Message Processor's Certificate in Message #11. However, it immediately sends a Fatal Alert: Bad Certificate to the Message Processor (Message #12). This indicates that the Certificate sent by the Message Processor was bad and hence the Certificate Verification failed on the backend server. As a result, the SSL Handshake failed and the connection will be closed. As you can notice, the backend server did not get any Certificate from the Client (Certificate Length: 0). Hence, the backend server sends the Fatal Alert: Bad Certificate. It is unable to send a Client Certificate. This can happen if it can't find a Certificate that is issued by one of the Backend Server's acceptable Certificate Authorities. Meaning, if the Certificate Authority of the Client's Leaf Certificate (i.e., the first Certificate in the chain) does not match any of the backend server's acceptable Certificate Authorities, then the Message Processor will not send the certificate. Let's look at each of these causes separately as follows. If there is no Certificate in the Keystore specified in the SSL Info section of the Target Endpoint or the target server used in the Target Endpoint, then that's the cause for this error. Get the Keystore reference name from the Keystore element in SSLInfo section in the Target Endpoint or the Target Server. In the above example, the Keystore reference name is "myKeystoreRef". Go to Edge UI and select API Proxies -> Environment Configurations. Select the References tab and search for the Keystore reference name. Note down the name in the Reference column for the specific Keystore reference. This will be your Keystore name. In the above example, you can notice that myKeystoreRef has the reference to "myKeystore". Therefore, the Keystore name is myKeystore. Check if this Keystore contains the Certificate either using the Edge UI or this management API. If the Keystore does contain Certificate(s), then move to Cause: Certificate Authority Mismatch. If the Keystore doesn't contain any Certificate, then that's the reason why the Client Certificate is not sent by the Message Processor. Ensure the proper and complete Client Certificate chain is uploaded to the specific Keystore in the Message Processor. Generally when the Server requests the Client to send its Certificate, it indicates the set of accepted Issuers or Certificate Authorities. If the Issuer/Certificate Authority of the leaf certificate (i.e., the first Certificate in the Certificate chain) in the Message Processor's Keystore does not match any of the Certificate Authorities accepted by the backend server, then Message Processor (which is a Java based process) will not send the Certificate to the backend server. List the Certificates from the Keystore. Get the Details of each Certificate obtained in Step #1 above using this management API. Note down the issuer of the leaf Certificate (i.e., the first Certificate in the certificate chain) stored in the Keystore. In the above example, the issuer/Certificate Authority is "CN=MyCompany Test SHA2 CA G2, DC=testcore, DC=test, DC=dir, DC=mycompany, DC=com"
In the sample TCP/IP packets shown above, Certificate Request packet is message #7. Refer to the section "Distinguished Names", which contains the backend server's Acceptable Certificate Authorities. Note: The list of backend server's "Acceptable Certificate Authorities" is populated by adding the issuers of all the Certificates stored in backend server's Truststore. Verify if the Certificate Authority obtained in step#3 matches with the list of backend server's accepted Issuers or Certificate Authorities obtained in step #4. If there's a mismatch, then the Message Processor will not send the Client Certificate to the backend server. In the above example, you can notice that the issuer of the Client's Leaf Certificate in the Message Processor's Keystore does not match any of the backend server's Accepted Certificate Authorities. Hence, the Message Processor does not send the Client Certificate to the backend server. This causes the SSL handshake to fail and backend server sends "Fatal alert: bad_certificate" message. Ensure the certificate with the issuer/Certificate Authority that matches the issuer/Certificate Authority of the Client's Leaf Certificate (first certificate in the chain) is stored in the backend server's Truststore. In the example described in this Playbook, the Certificate with the issuer "issuer" : "CN=MyCompany Test SHA2 CA G2, DC=testcore, DC=test, DC=dir, DC=mycompany, DC=com" was added to backend server's Truststore to resolve the issue. TCP/IP packets captured on the backend server or Message Processor. Output of List the Certificates from the Keystore API and also the details of each Certificate obtained using this management API.